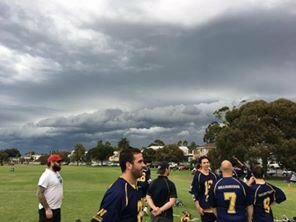 It started out a perfect day for lacrosse down at the Greenwich Reserve last Saturday, with a good crowd eager to see how the premier State League team looked for the start of the season and watch Captain Matthew (Frogga) Price run out for his 200th State League game. Well Done Frog. Also congratulations to Huw Wlson and the returning Tom Pike for being named this year's vice captains. The day started with a very successful U 11 scrimmage with many newcomers enjoying their first experience in a lacrosse game. With a number of faces missing from the 2016 Premiership side we welcomed newcomers Brian Bach (ex Melb Uni) and US player Brendan Mcguire into the team for their first taste of Willy Lax. Briefly, S/L were on fire, and at half time were in a commanding position at 16 - 2 when head referee, Alan Black, darted for the Rule Book as he noticed a number of lightning strikes closing in from the West. Soon it was evident, as the heavens opened, that this game may not continue as we headed for the pavillion 5 min into the third quarter and a scoreline of 17 - 3. A formidable lead for that stage of the game. Players and spectators were nearly all in agreeance as the referees and coaches called it a day with LV to decide the outcome which has since been declared as an abandoned game with 2 premiership points awarded to each team. Hmmmmmm ???? So the only player upset with abandoment was Frog now sitting on 199.5 games. Maybe after Easter. The club warmly welcomes US player Brendan McGuire to the best lacrosse club in Australia. Brendan has already started to assist with junior training and we are sure that he will be a great addition to the club both on and off the field. This year we are sharing the burden of the accommodation and support provided to our guest. Tink and Lauren have kindly taken it upon themselves to accommodate Brendan until the end of April. We are seeking a Williamstown player or families to provide assistance. This year we have arranged a renumeration package to assist the host family. Contact Wayne on 0409 386 256 or Damo on 0447 329 397 if you are interested in helping support this initiative. Can't wait until after Easter for a lax fix ? Then get down to Paisley Park to cheer on the big V and especially our representatives, Callan Gibson, Lachlan Russell and Jacob Poole at the U 18 National Lacrosse Tournament hosted by Altona Lacrosse. Click here for the full schedule and keep up to date with all the results. Go boys- we know you will do yourselves and the club proud. Wishing all club members, family and friends a Happy & Safe Easter and looking forward to see all in full swing after Easter. Travel safely. As the days draw shorter and The Fearon remains Off Limits, please take note of training times & venues and keep an eye on Team App for last minute changes. With the season just about in full swing please ensure you pay your fees to avoid disappointment of not being available for selection.